In a discussion the other night at O'Reilly's ETech conference, we came up with a few ideas about what such a code of conduct might entail. These thoughts are just a work in progress, and hopefully a spur for further discussion. Read the the proposed Code, and its explanation. The disturbing Kathy Sierra situation has made me think some more about the tone that the discussion occasionally takes in the comments of this blog. I can never do that thing. Sherm must be right. Cause I really like this commercial. WEST DANVILLE, Vt. --At Joe's Pond, they put a 65-pound cinder block on the ice and tie it to an old-fashioned alarm clock on the deck of Homer Fitts' cottage, 200 feet away. When the block falls through, the string tugs on the clock and stops it. Yesterday I busted out of the online poker tournament I was playing in. This is the 16th edition of the more-or-less-annual World Rec dot Gambling Poker Tournament (WRGPT16). Number 16 began back in October with 1,314 players. My goal was to finish in the top 100 this time. And I was on the verge of making it. A couple hands back, a week ago, I was dealt a pair of Aces, and had no choice but to roll the dice and go all-in. It worked that time. But yesterday, my As-Ks (Ace spades-King spades), felt much less secure. The flop was Jc 8d Ah. So I had a pair of Aces, but the flush is dead. At this point it's just me and another guy. Me with very few chips. Him with A LOT OF THEM. He bet to force me to go all-in. If I had folded I would have been left with almost nothing. My cards were weak, but possible (I thought), so I went for it. Now I was all-in, so the betting was done. I flipped my A-K, he showed 10-10. I'm winning, my Aces against his 10s. But there are two cards to go. The Turn is Qc (Jc 8d Ah Qc). I'm still winning. But do you see what's happening? The River is 9d (Jc 8d Ah Qc 9d). He has a straight! I'm busted. My goal had been to finish better than #100. I ended up at #147. Not so bad I guess. If you call it a "breakfast brownie," it sounds much more nutritional. I keep visiting the zefrank site hoping to see another episode. But he's really stopped. On this week's TWIT, Scoble reported that Ze told him that he was planning to take some time off, clean up the show site, and probably reappear with new projects in the near future. Just watched the concert movie "The Last Waltz" with The Band, and a gang of special guests. It was filmed in 1976. Many of the artists are still around today. 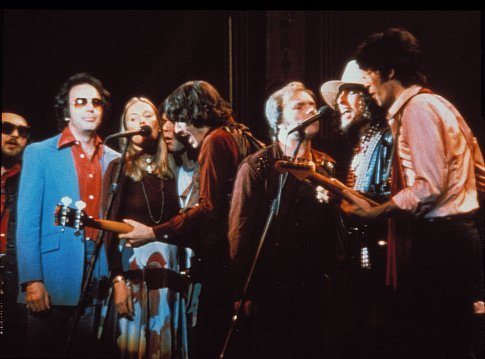 The theme of the movie was the final performance of The Band, after 16 years touring on the road. They were nearly burned out. It was as if they had had a full career, and were ready to retire. And most of their guests were already legends too. They are all so young. I can just stare at this thing forever. Pop Quiz: I can see at least one place where balls are disappearing so there must be someplace where they are appearing. Where? Oh, and the music is addictive. This is genuinely weird. Use caution. But give it a try. Found this by way of StumbleUpon. 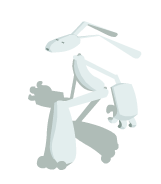 Don't let the rabbit grab your cursor, cause it's hell to get him to let go. I'm jazzed about the new, early arrival of daylight saving. The idea of taking an hour off one end of the day and adding it to the other — daylight-saving time — was first proposed by Benjamin Franklin while he was serving as an American delegate in Paris. In an essay titled "An Economical Project," he discussed the thrift of natural versus artificial lighting and noted that if the Parisians shifted time correctly they could save enormous amounts of tallow and wax used for candles. Franklin was 78 at the time, and wrote the essay somewhat in jest. But some of his friends, who had invented a new kind of oil lamp, were quite taken with the idea. Pretty funny spoof on the hit TV show "Heroes". ZEFrank is on the home stretch of his yearlong commitment (aka "internship") to giving us a new video each weekday. Next week is the final week of TheShow. 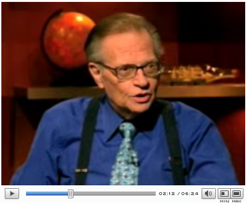 Larry King was on the Colbert Report the other night. I've never been a big fan of King, but he handled himself well in one of the oddest interview situations on network TV. "Quantity has a quality all its own." Barenakedladies video starring YouTube contributors. Hope all my Forum buddies are OK.
Ze is ready to snap? ZeFrank has been doing his little show every weekday for almost a year now. He finishes up the project in just a few weeks, on March 17. But will he make it? At the end of today's show he started to lose it.